Joni sings Song to a Daydreamer or Blue on Blue, inspired by an overheard conversation at a fair in Regina, Saskatchewan. Hosts, Adrienne Clarkson and Paul Soles, talk with her about her songs. Joni informs them that she is living in Detroit (and regularly performing in clubs and festivals around the USA). She explains why she no longer sings "beautiful but miserable and dreary" traditional English folk songs. Originally aired on May 1, 1967. 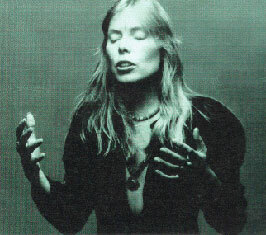 Joni has taught me, more than anyone else, how to, as an artist, talk about your work.